Plants stoloniferous. 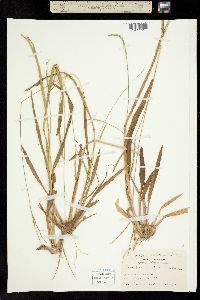 Culms 30-100 cm; nodes glabrous or pubescent. 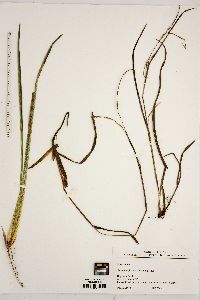 Sheaths compressed, glabrous or sparsely to densely pilose, hairs appressed; ligules 0.3-1 mm; blades 3-25 cm long, 2-15 mm wide, margins often with papillose-based hairs near the base, scabrous distally. 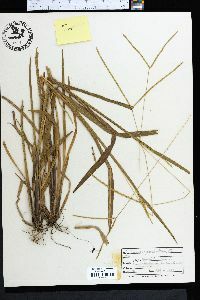 Panicles terminal and axillary, with 2(-4) divergent branches; branches 4-15 cm. Spikelets 3.5-5.5 mm long, about 1.5 mm wide, sessile or subsessile, ovoid-ellipsoid, acuminate. Upper glumes glabrous, 5-7-veined; lower lemmas 5-7-veined, glabrous or sparsely pilose over the veins; upper lemmas and paleas 2.5-3.2 mm, light yellow, obtuse. Caryopses 1.8-2.2 mm, obovate, yellow. 2n = unknown. Axonopus furcatus is endemic to the southeastern United States. It grows in moist pine barrens, marshes, river banks, wet ditches, pond margins, and other such damp areas.